is this the new maxima coupe? I completely agree. I cant wait to see it in person. well, this car will look sooo much different in person. just take a 135i for instance. it doesnt look AMAZING on paper or the internet, but today on my way to school i saw a black one with a Chick driving it and the stance of the things along with the fender flares made it look AMAZING, totally different from the 2D version, same thing with the GTR, same thing with the Z34. the pictures just dont do it justice. Your post count makes you appear like a newb, but your comments make you seem like you have over 1000 post. VERY well worded!! The pics do not do the 135i or the GTR justice at all. Heck, pics do not do the Maxima justice. Man!! Where have you been the past few months!?!??!?! Under a rock??!?!?! This is the Sentra Coupe!!! the thing i hate about it the most is the one thing aftermarket parts won't change...the roof/hatch line. I personally love it. If you saw it driving down the street, you would definitely turn your head for a good reason. Funny thing is outside of this forum, away from the 350Z owners, just about everyone likes the looks of the 370Z. Read the forums in the general auto websites. 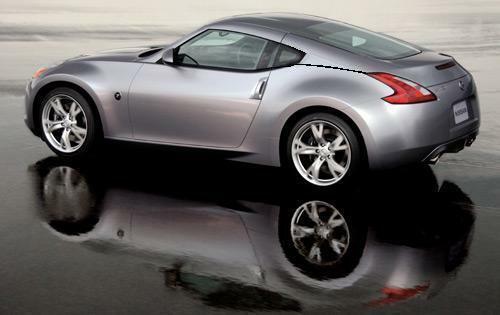 Almost everyone likes the looks of the 370Z a lot. 350Z bias in this website??? i love the interior, its insanely nice. but the back of the car is kinda, ehh, o well we'll hafta see it in black to make sure! Wow this thread got big fast! Honestly, a bone stock 350z is not exactly a sight for sore eyes. It only looks good when tastefully modified. I love everything about it. The taillights look really good. The 350z taillights don't flow well at all. This is where they made a major improvement. I like that the front end is aggressive and how compact the car looks now. These pics aren't real though. I want to see a real pic. wow the NEEd for speed video really just got me.... sooo sickkk!!!! this is by far one of the BIGGEST let downs in my life. I absolutely do not like the way it looks. Interior is nicer, but to me it looks too short. The current Z is short enough as is.